Self-centering bore target for measuring the straightness of long, small-ID bores, such as gun barrels and other similar cylinders. 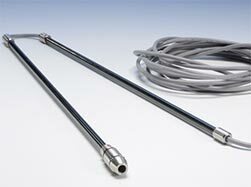 Each target is customized to the nominal bore ID and comes with a self-centering adapter, insertion pole and cable. Can be used on bore diameters from .70” (17.8 mm) to 1.5” (37.6 mm). Requires a modified L-705 or L-706 Bore Laser with a small-diameter beam.